When I was a wee lad, Christmas at the dinner table never included ducks, hams, or turkeys. It was always a standing beef rib roast, crusted with peppercorns, the color of dark hickory. I thought I was doing the table a favor when I requested an end piece, saving the more luxurious medium-rare center cut for more deserving guests. I had my reasons. The end piece, although a bit less pink, was where visible fat caramelized into delicious crisp gnarls, where the flavors from the marinade concentrated, and through the roasting process, amplified its natural beefiness 10 times louder. Our rib roast was unconventional. 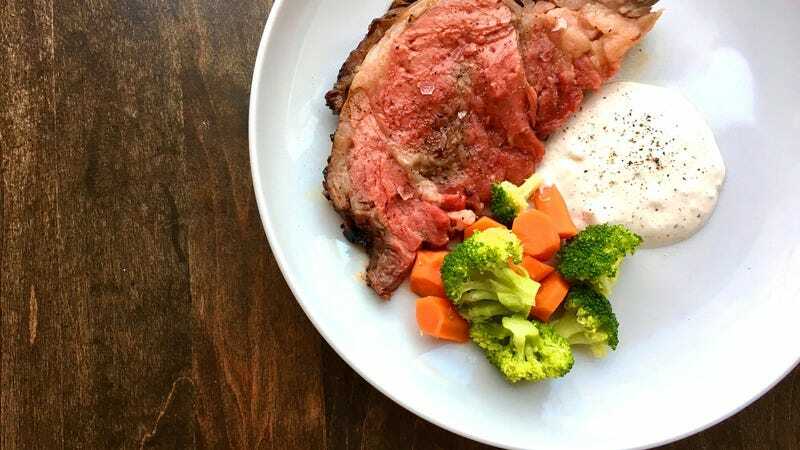 The idea that we would marinate a desirable cut of beef like a bone-in ribeye roast is, to some, ruining a perfectly good thing (bless the purists who preach “a good piece of meat needs nothing more than salt and pepper”). That my mom would marinate this expensive six-pound cut with essentially soy sauce and ketchup might even make a butcher faint. But let me tell you: The results may forever change your perceptions about roast beef. Close observers of The Takeout may have noticed our ongoing obsession with umami, the hard to describe but easy to identify taste sensation that roughly translates to savoriness. This recipe aims to pack the beef roast with as much umami-per-cubic inch as nature allows, creating a crusty outer carapace of savory pepperiness. Marinate it Saturday night for an impressive and surprisingly easy Sunday roast, and it’ll transform into magnificent roast beef sandwiches for Monday and beyond. I should preface that some of these cooking instructions from my mother seem counterintuitive. I’ve streamlined the method where necessary, but some steps—like seasoning the raw rib roast with crushed peppercorns, then pouring the marinade on top—doesn’t make much culinary sense. All I know is in the dozen times I’ve roasted this, I’ve followed my mother’s recipe to a T and it emerged beautiful and perfect each time, without fail. You may notice there’s ketchup in the marinade—egads! But ketchup has a lot of umami qualities that work well here, and the sugars within create an attractive caramelized crust while roasting. The secret weapon in this recipe, however, is cardamom. It gives the marinade a shadowy tea smokiness that adds yet another layer of umami. 1. Using a mortar and pestle, crush whole black peppercorns into chunky bits. Rub pepper over every surface area of the roast. In a mixing bowl, whisk Maggi seasoning, vinegar, and ketchup together. Then add cardamom, paprika, garlic, and onion powders and mix well. 2. Place the pepper-crusted rib roast into a container, such as a plastic food storage bin or a lidded ceramic casserole dish. Using a paring knife, pierce into the rib roast in several places, then pour the marinade over the rib roast. If you’d like, you could also use a syringe to inject sauce into the roast. Cover and let marinate in fridge overnight. The next morning, flip the roast inside the marination container so the other side can get some love. 3. When you’re ready to roast, line a roasting tray with aluminum foil. Place the beef on an elevated cooking rack. Take all the marinade left in the container and pour through a fine-mesh sieve. You’ll be left with a lot of crushed peppercorn. Add the solids to the half stick of melted butter and mix with a spoon. This will become a goopy mixture, which you’ll then slather on top of the roast. Save the wet marinade. 4. Roast at 350 degrees for 20 minutes per pound. After the first half hour, baste the roast with some of the wet marinade. After an hour in the oven, baste again, then cover roast with tin foil. Remove from oven five minutes before it’s done, and let rest for at least 20 minutes. Don’t skip this last step! I like serving this with horseradish sauce (one part grated prepared horseradish, one part mayonnaise, two parts sour cream, a pinch of salt, and lots of cracked black pepper).